Reading color coded resistors is easy, if you know how. When you say reading, you really mean knowing the value of a resistor, before you put it in a circuit. Reading color coded resistor's value is a basic knowledge or skill that one should have if they are into electronics and electricity. It is one of the foundation skills needed. That code is used to know the value of the colors. To fully understand and a tutorial on how to read the value of a resistor through its color codes, we've selected the best sites around. Browse and enjoy. Resistors are color coded for easy reading. Imagine how many blind technicians there would be otherwise. 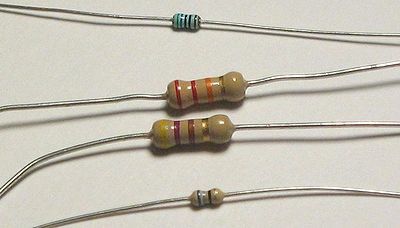 For example, a resistor with bands of yellow, violet, red, and gold will have first digit 4 (yellow in table below), second digit 7 (violet), followed by 2 (red) zeros: 4,700 ohms. Gold signifies that the tolerance is ±5%, so the real resistance could lie anywhere between 4,465 and 4,935 ohms. Great article about resistors. Resistors can be difficult to understand at first, but once broken down in to type and code it becomes much easier. Great post!